This book assesses the impact of post-9/11 domestic counterterrorism policy on US political life. 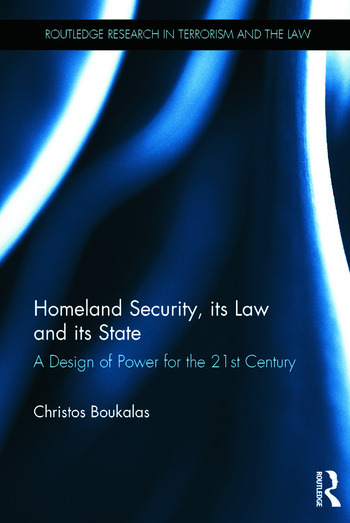 It examines political discourse, law, institutional architecture, and state-population relations, and shows that ‘homeland security’ is a project with wide-ranging implications for democratic institutions and culture. These implications are addressed through a novel approach that treats law and the state as social relations, and relates developments in law to those in the state and in social dynamics. On this basis, the book examines the new political representations in counterterrorism discourse, especially regarding the relation between the state and the population. It examines the form and content of counterterrorism law, the powers it provides, and the structure and functions it prescribes for the state. By focusing on the new Department of Homeland Security and the restructuring of the intelligence apparatus, the book assesses the new, intelligence-led, policing model. Finally, it examines forms of popular support and resistance to homeland security, to discuss citizenship and state-population relations. The author concludes that homeland security has turned the US into a hybrid polity; the legal and political institutions of democracy remain intact, but their content and practices become authoritarian and exclude the population from politics. These legal and political forms remain operative beyond counterterrorism, in the context of the present economic crisis. They are a permanent configuration of power. This book is an indispensable companion for students of (counter-) Terrorism and Security Studies, Politics, Human Rights, Constitutional and Criminal Law, American Studies, and Criminology. Christos Boukalas is a Law and Society Research Fellow at Cardiff Law School.